The Anatomic Pathology lab has experienced monumental changes in recent years expanding the pathologist’s role beyond a cancer diagnosis to being a key contributor who delivers critical patient results defining treatment selection. The onslaught of genetic and molecular technologies and the increased availability of cancer targeted therapies has further added complexity to the pathologists’ role as they learn new approaches to interpretation of results and reporting. In this era of personalized medicine, it is critical for pathologists to have access to tools supporting their expanded roles. Whether Next Generation Sequencing genetic profile tests, complementary tests for OPDIVO® and TECENTRIQ® or companion diagnostics for KEYTRUDA®, the importance of new personalized diagnostic tests cannot be overstated. These test results guide chemotherapy and immuno-oncology therapy treatment decisions, which potentially give hope to end stage patients without options. As more personalized diagnostic tissue tests emerge, the anatomic pathologist continues to play a pivotal role in the treatment continuum. The initial surgical biopsy stage and grade for a cancer patient is just one step in determining the treatment plan. Advanced stage or disease progression after initial treatment generally leads to testing for gene mutations and protein expression where various biomarkers are tested. The pathologist ultimately decides if a patient will be a candidate for targeted therapies such as immunotherapy or biologic therapies. Clinical studies for personalized diagnostics, stratify diagnostic test results based on clinical study results correlating to patient outcomes. The patient treatment path is defined when personalized diagnostic results are delivered to oncologists, making accurate result reporting, critical for pathologists reading slides. A personalized diagnostic tissue interpretation is highly complex due to precise scoring analysis and a threshold for treat vs. no treat decision-making. 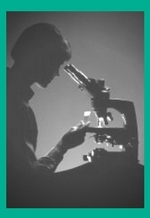 To aid pathologists’ accuracy and confidence it is paramount that training tools are developed. Pathologists need to have confidence when scoring and be able to answer the following questions with confidence for an accurate pathology report. Do we appropriately perform the test in our lab i.e. Are we performing all the steps critical for optimal performance of the test? Am I using the correct threshold for positive expression level reporting? What tissue components are included/excluded in the scoring? How many cells must be counted for an accurate score? Which normal tissue elements are expected to stain? What interpretation challenges do I need to understand for a given tumor type/indication? What elements are important to include on the pathology report? While onsite training remains a primary pillar, eLearning is becoming an increasingly vital complement to give pathologists a more robust training experience. An eLearning program is a self-paced, online tool that provides a more intimate level of training for tissue diagnostics interpretation. These programs enhance traditional training methods and build confidence in an era of information overload providing the following benefits. Context: Comprehensive information on the product performance specifications, clinical study data defining the related biomarker expression outcomes, and technical tips for optional assay performance provide context to answer the why and how behind testing. An eLearning program is the perfect place to reinforce and outline important principles found in the product use instructions. Interpretation Guidelines: Pathologists are often examining and interpreting multiple tests from several vendors each day. Make their job easier by clearly outlining the product interpretation guidelines and helpful hints for scoring cases. Example Cases: As they say, practice makes perfect. An eLearning solution includes multiple cases a pathologist can examine and practice scoring, including challenging cases to broaden the pathologist’s repertoire. Allowing for practice scoring whole slide images, rather than just portions of a sample from a given field of view. Allowing for practice viewing samples at various magnifications to identify a methodology that results in accurate and reproducible scoring. Performance Summary: An eLearning program includes a score card or certificate of completion which creates a sense of accountability and accomplishment. Learning through “doing” is necessary in any medical specialty. Perhaps most critically in pathology, where knowledge is gained from what you see, not just what your read. eLearning digital programs are quickly becoming an essential learning tool enabling pathologists to report critical life changing results. Contact Market Ready Rx today on how we can develop and launch your eLearning program.